Patrick Caulfield (1936 – 2005) was a British painter and printmaker whose pictures combine simple graphics with a naive pictorial style in which personal, social, political and artistic images meet. 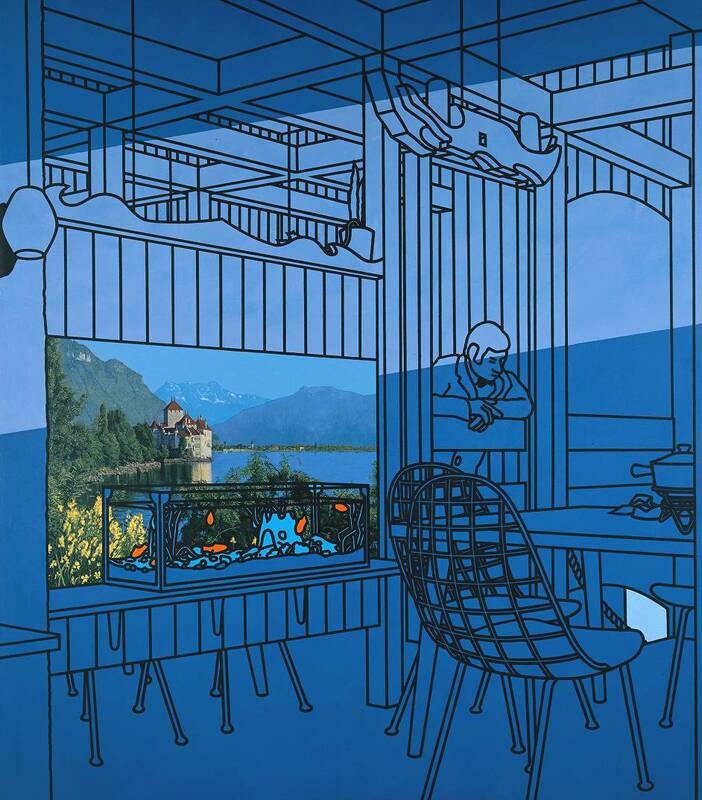 Caulfield studied at the Chelsea School of Art, London from 1956 to 1960 and at the Royal College of Art, London from 1960 to 1963, where his fellow pupils included David Hockney and R.B. Kitaj. 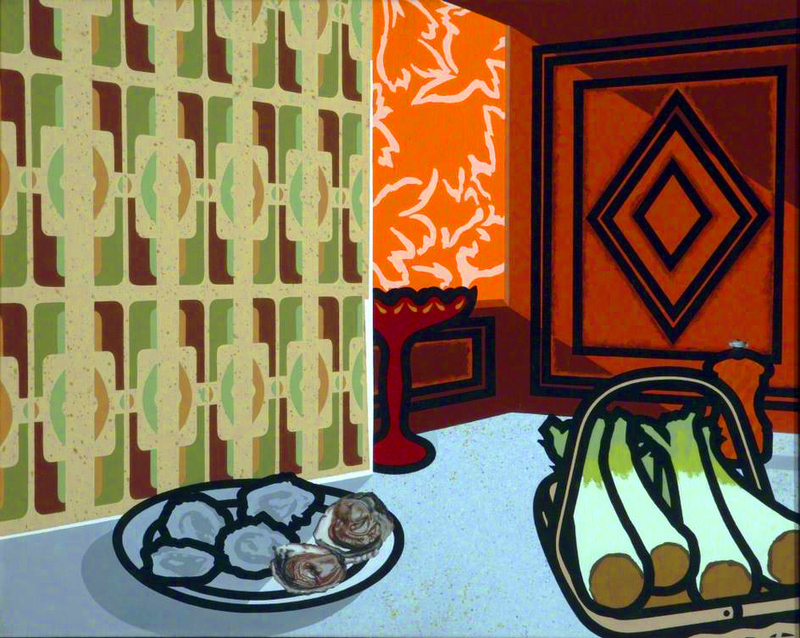 He returned to the Chelsea School of Art to teach from 1963 to 1971. 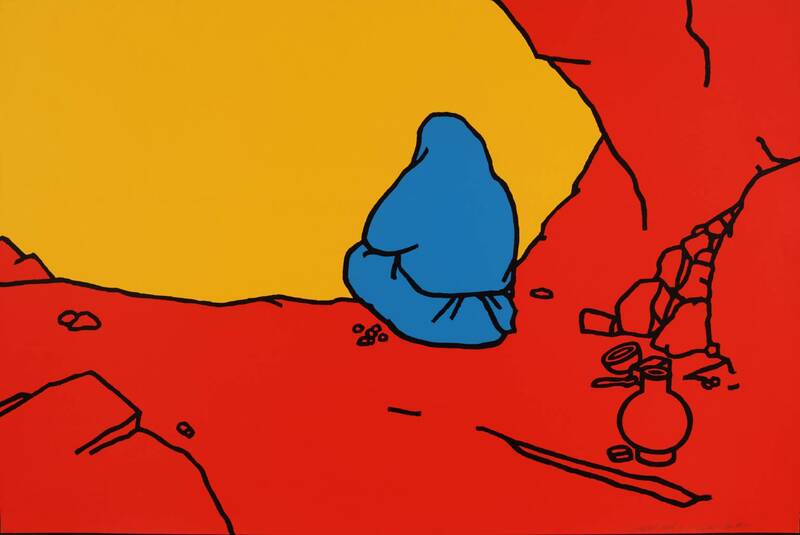 In 1964 he exhibited at the New Generation show held at the Whitechapel Gallery, which resulted in him being associated with pop art. 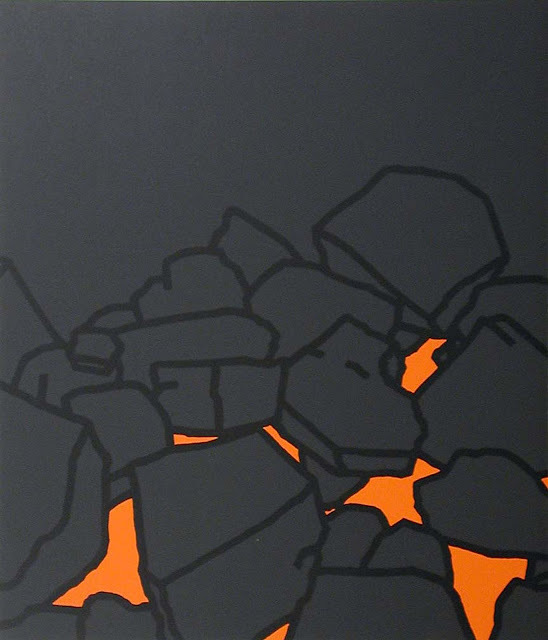 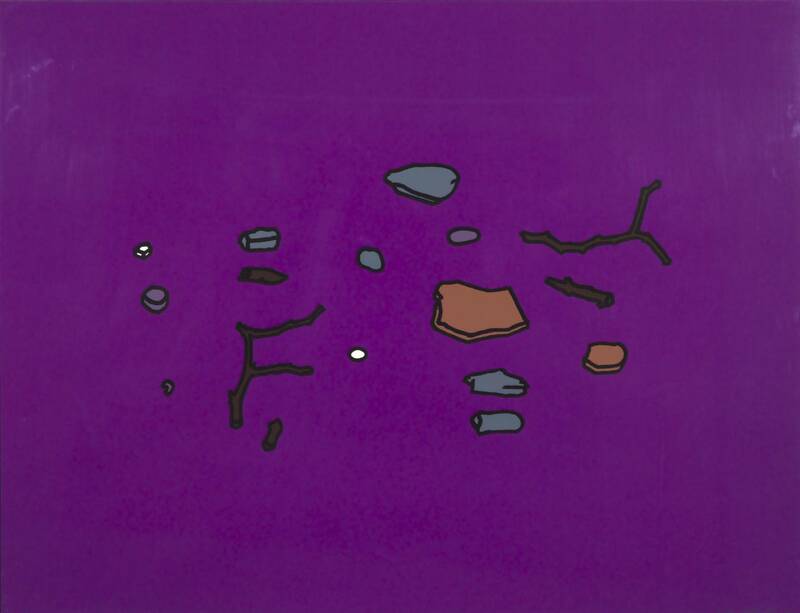 Caulfield’s first solo exhibition was held in 1965 at the Robert Fraser Gallery. 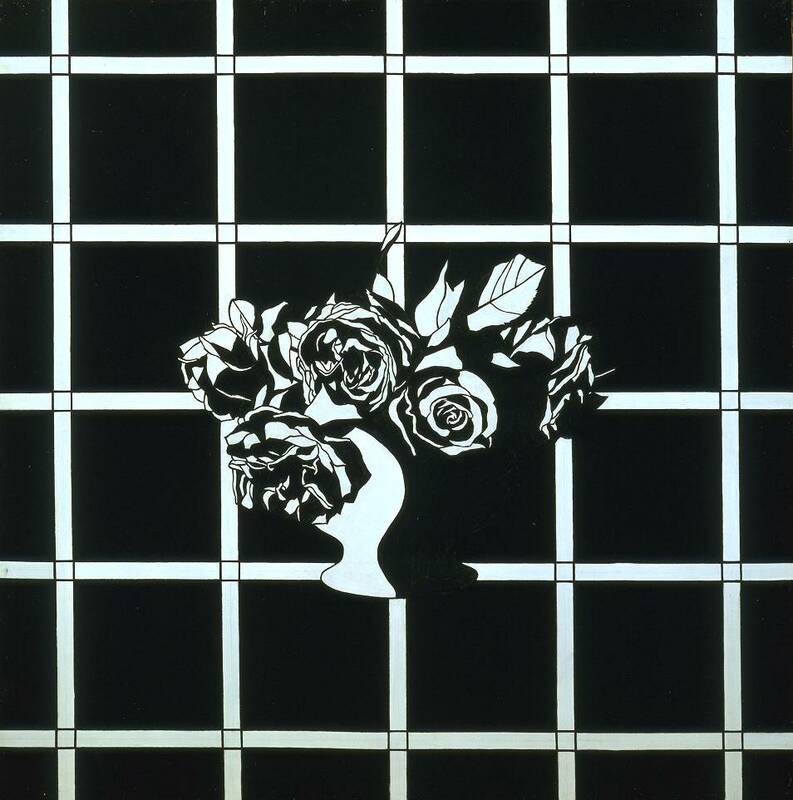 In 1965 he was represented at the Biennale des Jeunes, Paris and in 1967 at the International Exhibition of Graphic Art, Ljubljana, Yugoslavia. At the start of his career Caulfield's paintings were characterised by flat images depicting objects that were paired with angular geometric devices or isolated against unmodulated areas of colour. 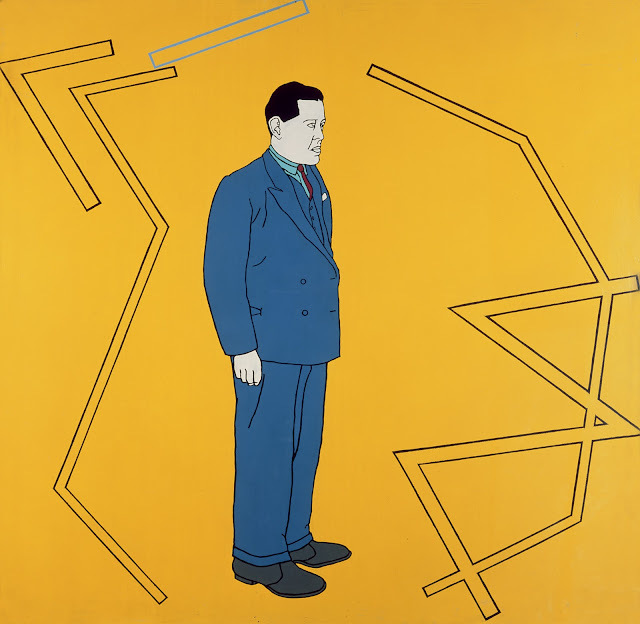 In Portrait of Juan Gris (1963) Caulfield paid tribute to the Cubist painter whose work, alongside that of other early modernists such as Léger and Magritte, established the principals of stylisation and formal rigour that he has employed in still lifes, landscapes and interiors. 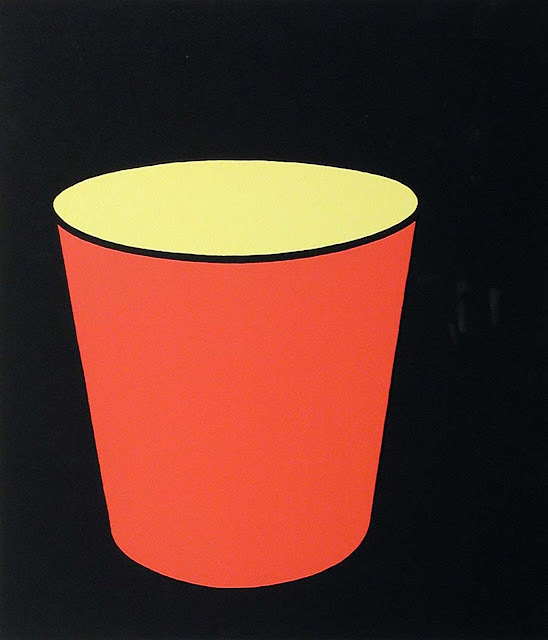 He adopted the anonymous techniques of sign painting, dispensing with visible brushwork and distracting detail and simplifying the representation of objects to a basic black outline in order to make them appear more iconic. 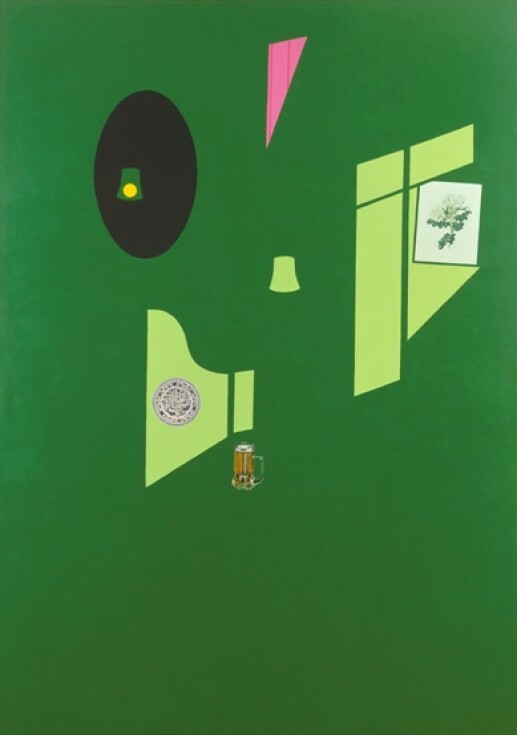 During this period he deliberately chose subjects that seemed hackneyed and mundane (Still Life with Dagger, 1963), overtly exotic and romantic (Artist's Studio, 1964) and picturesque (View of the Bay, 1964), which presented an emblematic view of Mediterranean ruins). 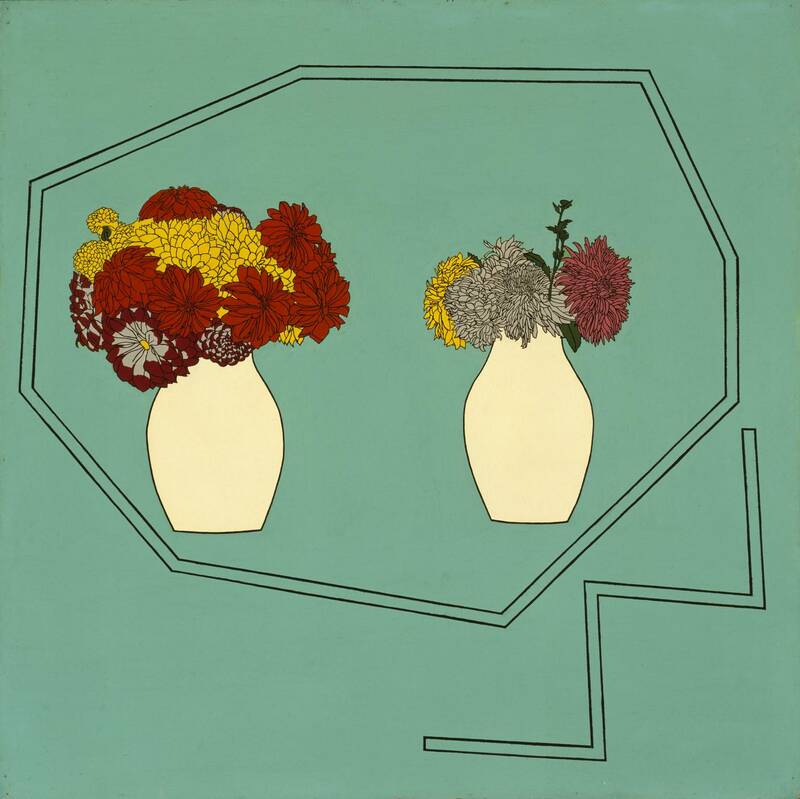 Later on Caulfield became more focused on the architectural elements in his work. 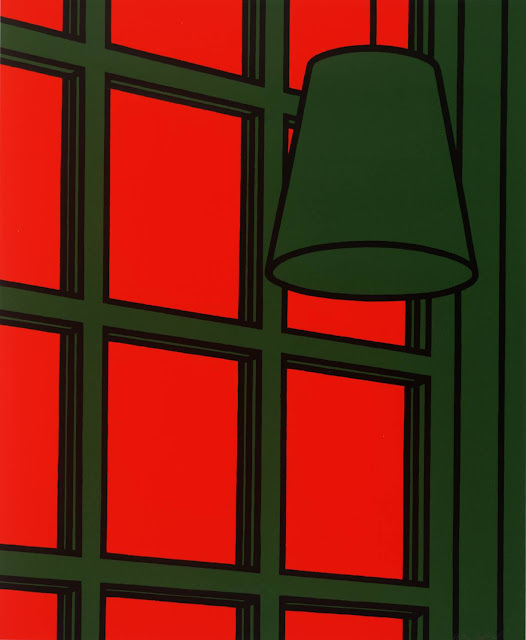 "Inside a Weekend Cabin" (1969) is one of the earliest examples of a series of interiors where the atmosphere is suffused with a single enveloping colour, enabling him to portray interiors with an atmosphere of introspection and melancholy. 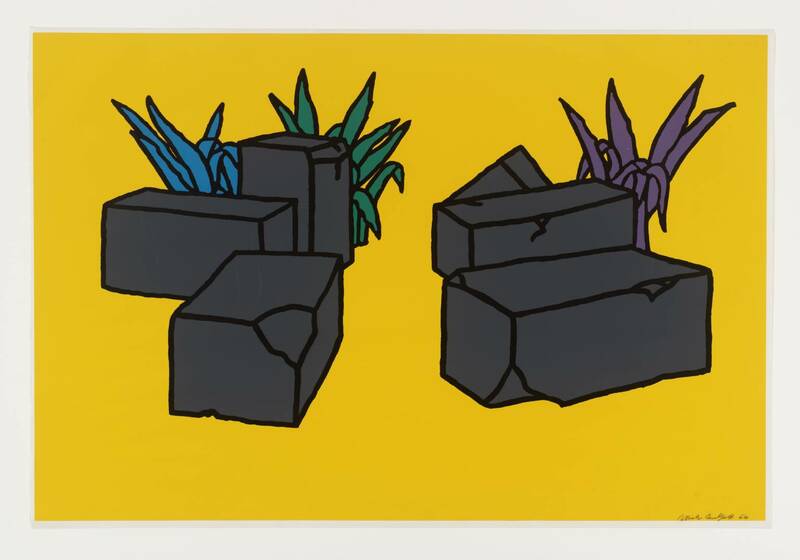 Caulfield is also a master of the screen print, the first of which, Ruins (1964), was commissioned by the ICA. 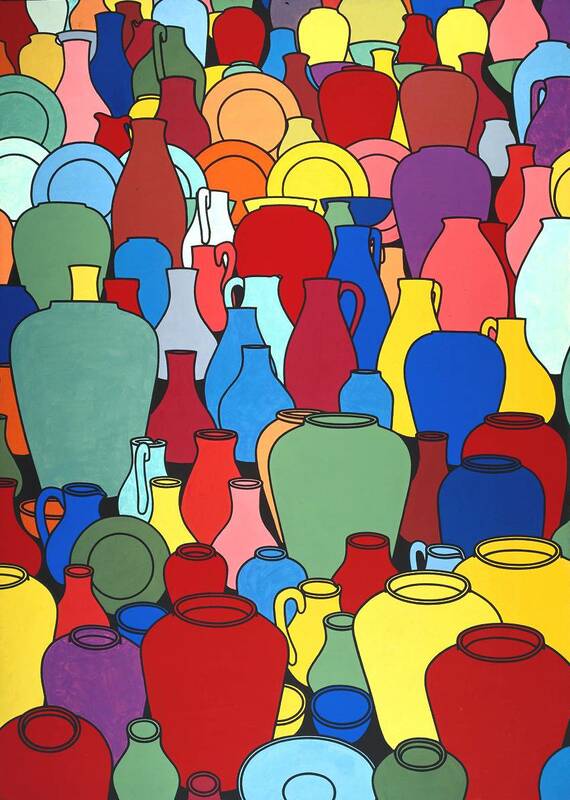 The medium suited his taste for vivid areas of flat colour, which mirrored the representative mixture of decorative opulence and technical austerity in his paintings. 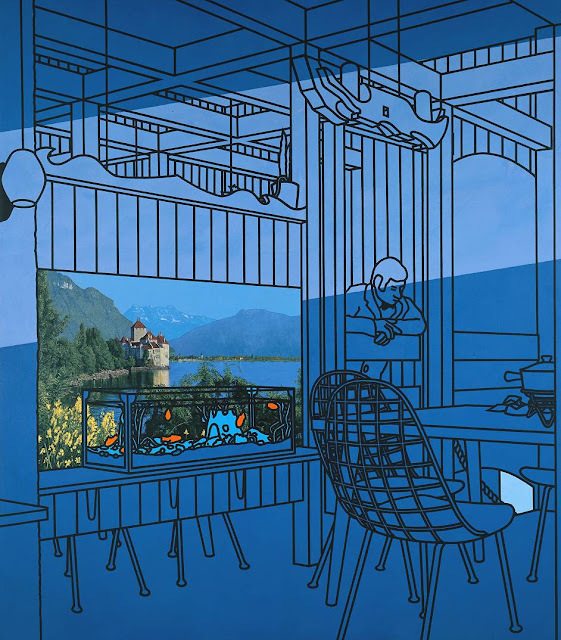 In works such as "After Lunch" (1975), Caulfield began to insert highly detailed passages in the photorealist mode into his canvases, playing up ambiguities of perceptions about what is real and what is artificial. 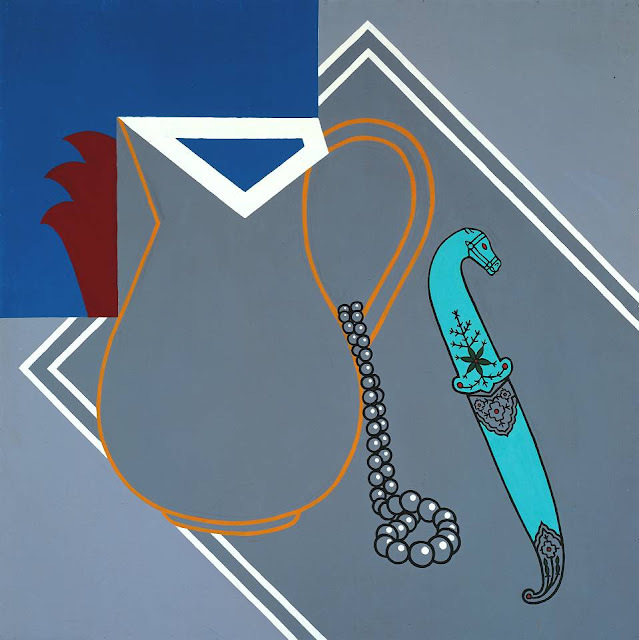 In later works like "Still-life: Autumn Fashion" (1978) he amplified this profusion of styles in increasingly elaborate still lifes, analysing the conventions of 20th-century painting. This high level of pictorial invention was sustained in such works as the mural for the London Life headquarters in Bristol (1982). During the 1980s he returned to a more stripped-down aesthetic in large paintings like "The Blue Posts" (1989), in which the precise disposition of a few identifiable elements transforms an ostensibly abstract picture into one evoking a vivid sense of place. 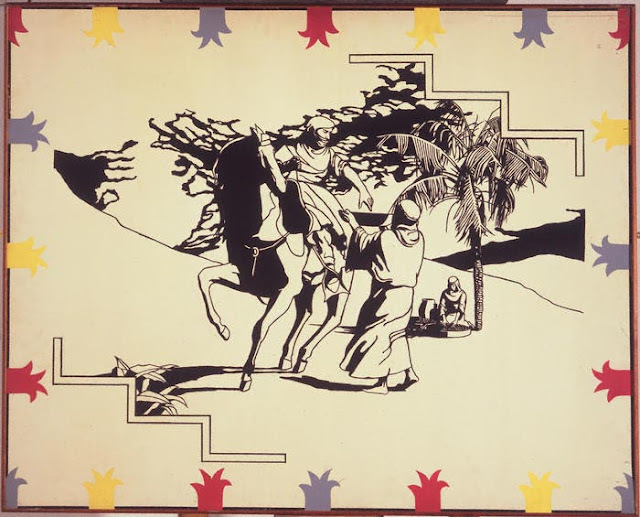 Among Caulfield’s many commissions are designs for the sets and costumes of Michael Corder’s ballet "Party Game" for the Royal Ballet at the Royal Opera House, Covent Garden in 1984. 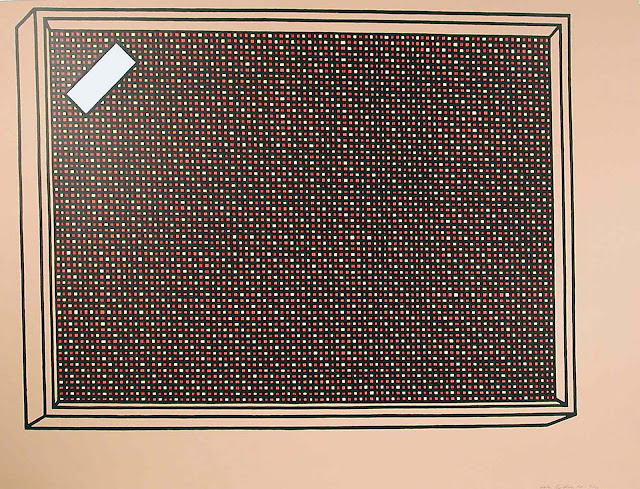 Other such work includes the carpet design for the atrium of the British Council offices in Manchester (1991) (in part 3 of this post) and the commission for the giant mosaic entitled "Flowers, Lily Pad, Pictures and Labels" at the National Museum of Wales in Cardiff (1994). 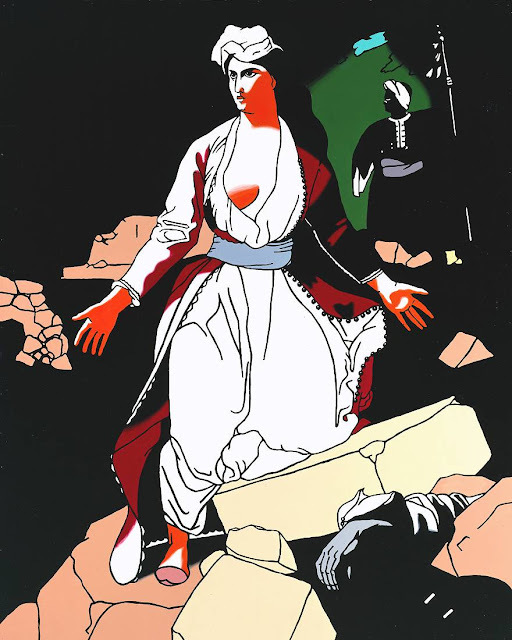 In 1995 he designed the sets and costumes for the production of Frederick Ashton’s "Rhapsody" at the Royal Opera House, Covent Garden, which went on to be performed at the Opera National de Paris in 1996. 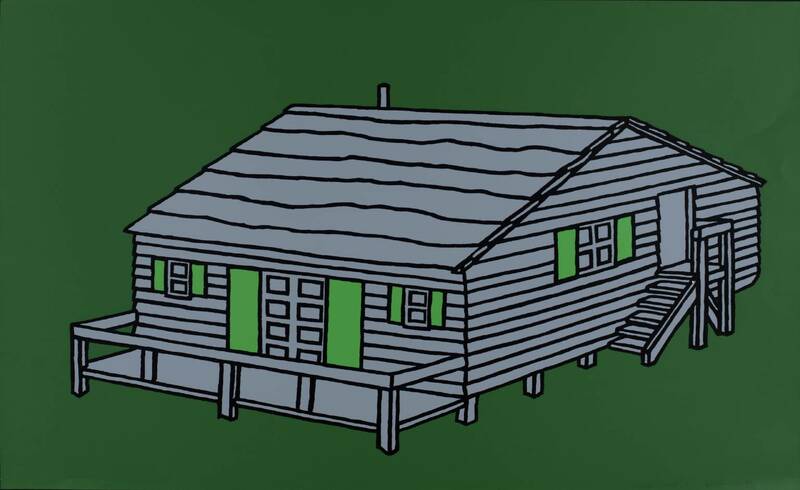 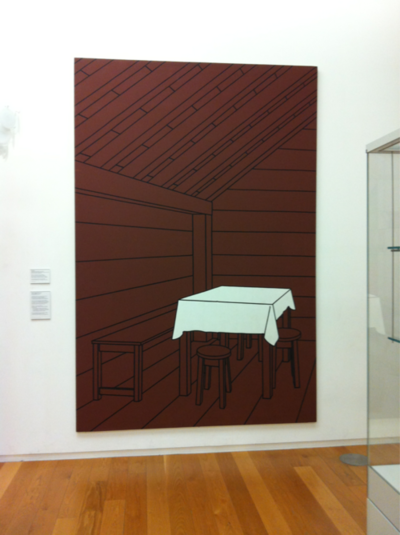 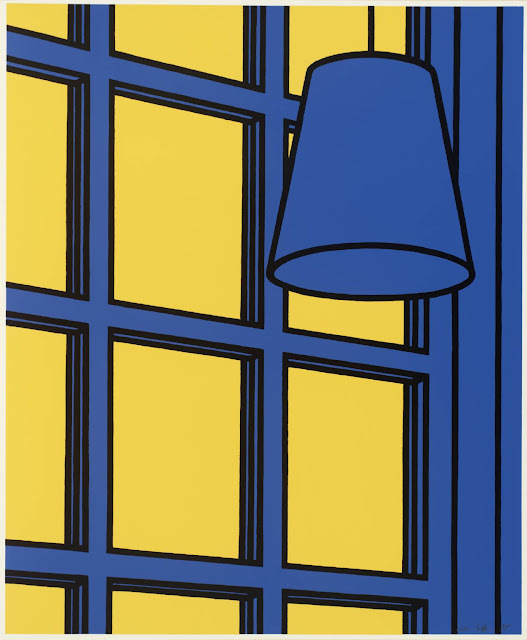 Patrick Caulfield was joint-winner of the Jerwood Painting Prize in 1995. In 1987 he was nominated for the Turner prize and in 1996 he was given a CBE and received an Honorary Fellowship of the London Institute. 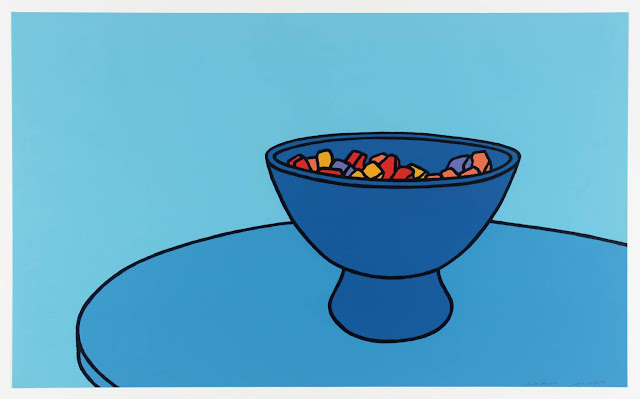 He died in 2005 and is buried in Highgate Cemetery in London. 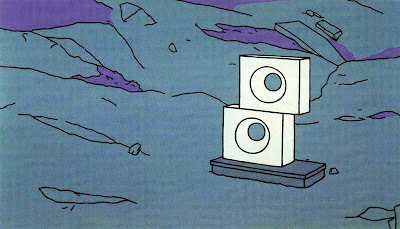 He had designed his own gravestone. 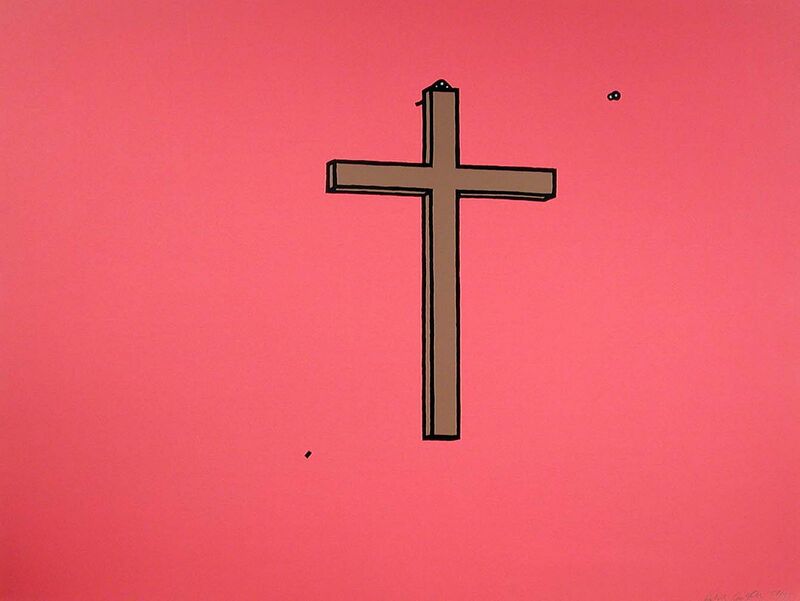 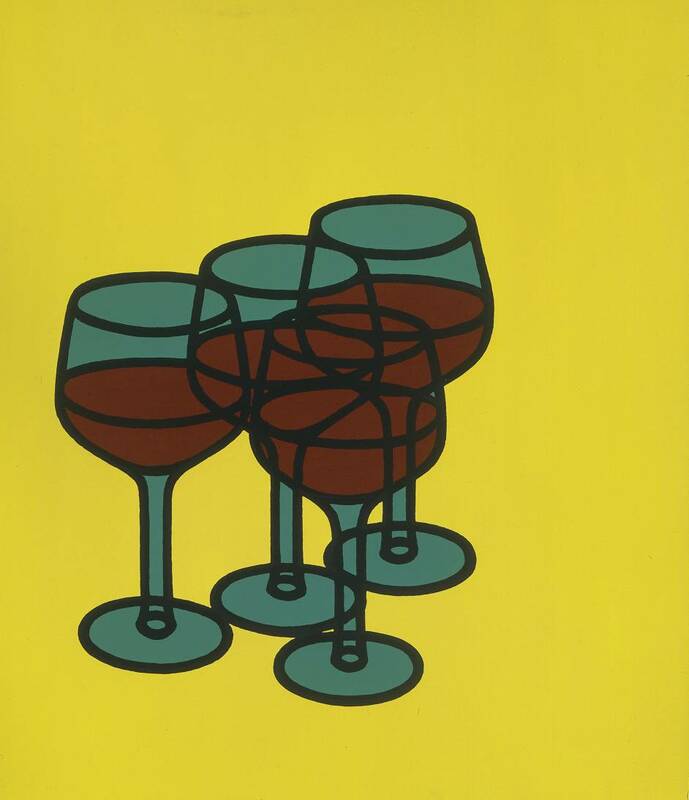 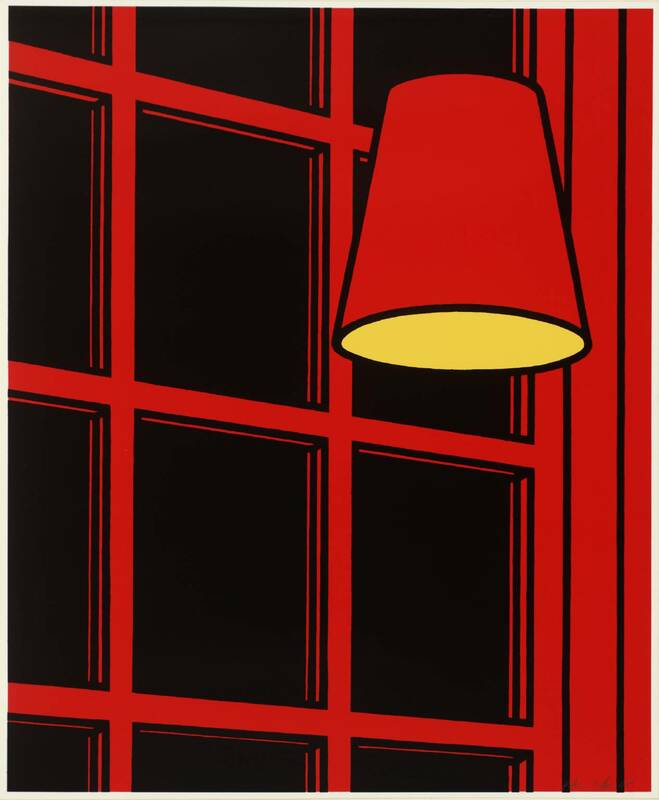 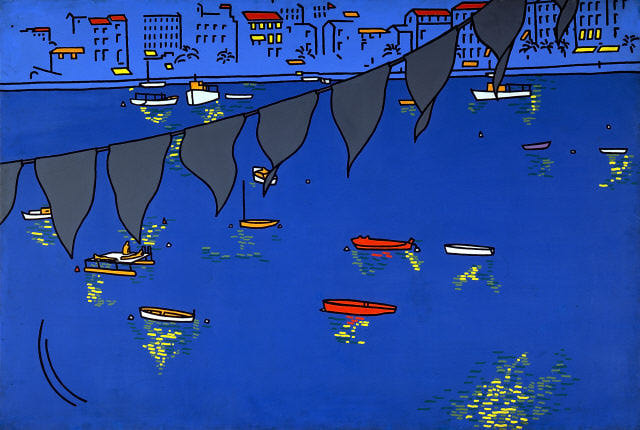 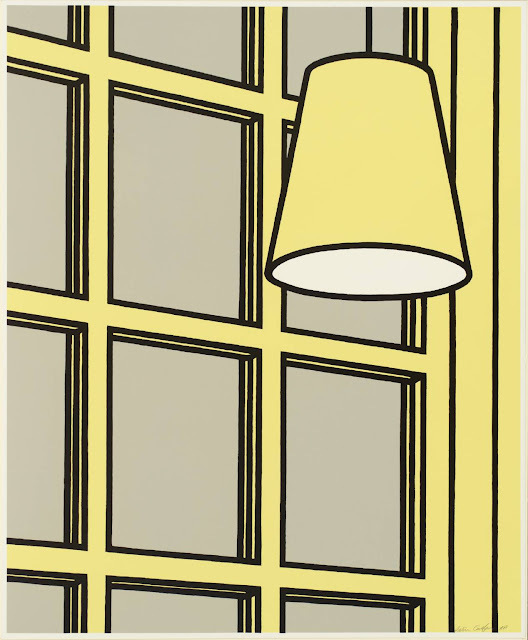 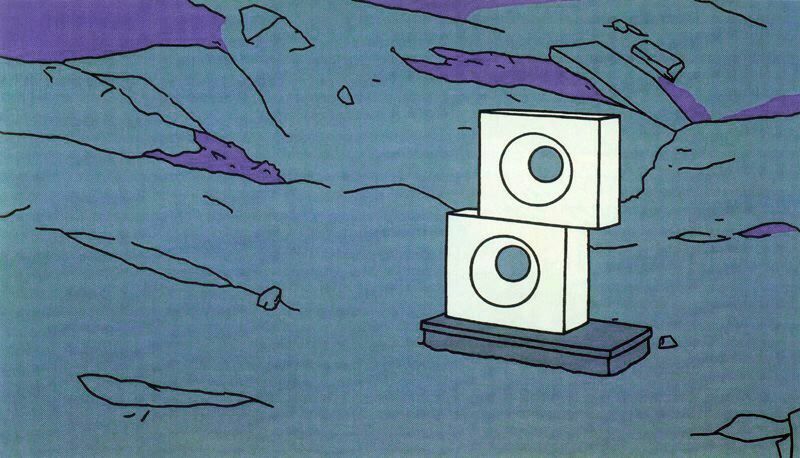 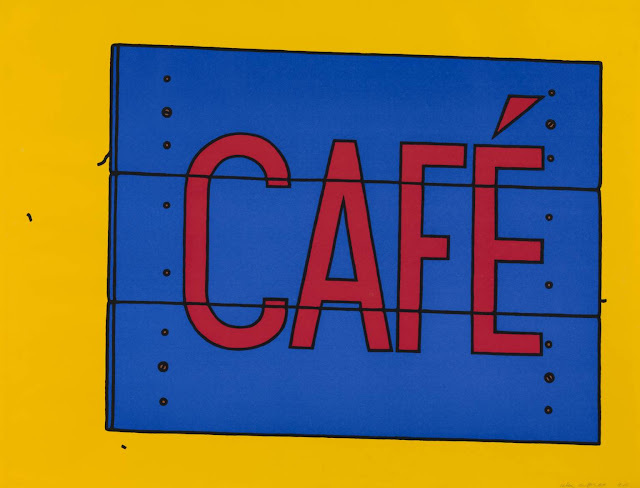 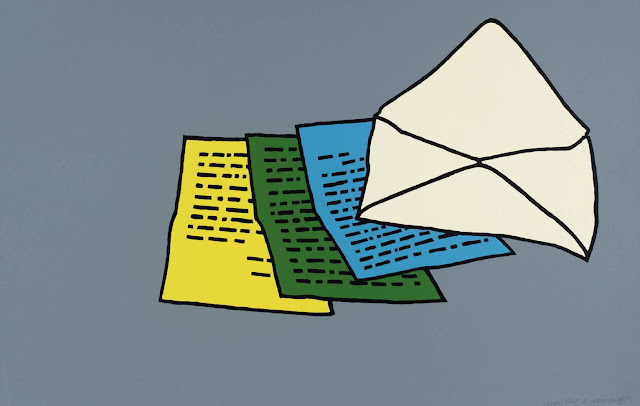 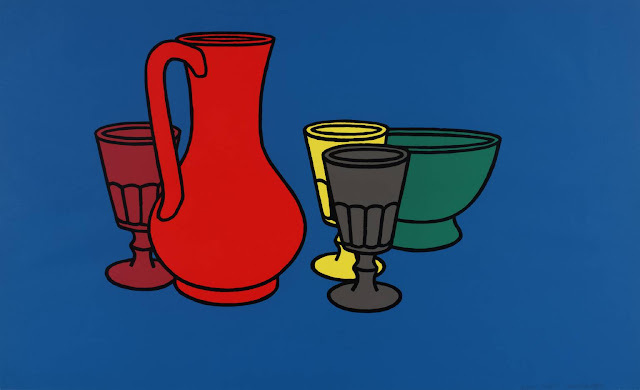 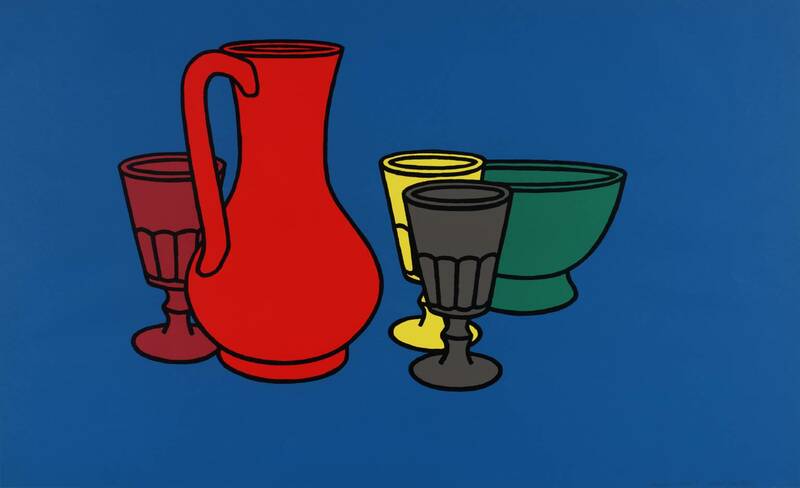 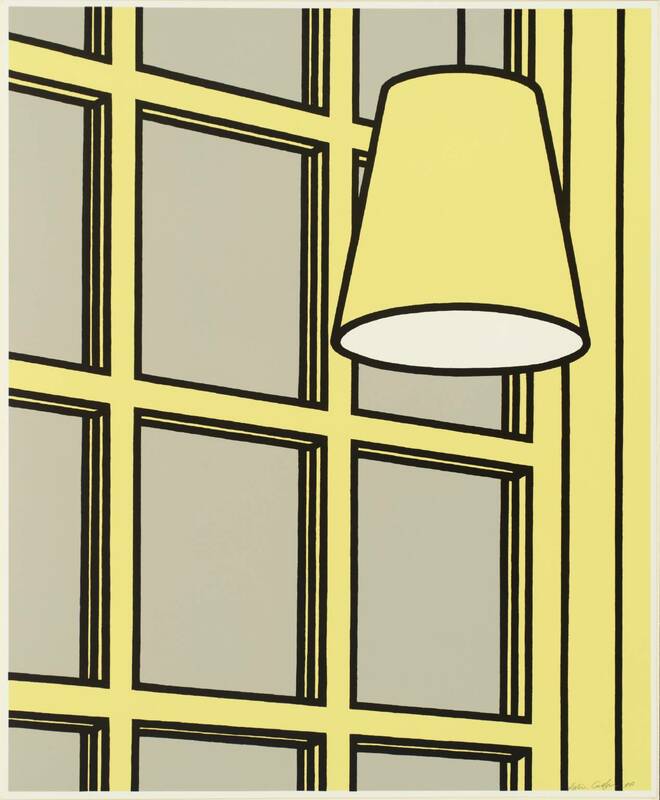 This is part 1 of a 4-part post on the works of Patrick Caulfield.